Speaking at his regular meeting with neighborhood and village heads (muhtars) at his presidential palace on Jan. 20, Erdogan said the signatories had given their “consent” to the killing of public servants by the PKK. “I’m saying frankly: This mindset which gives a self-styled fatwa to the terror organization’s attacks on public servants, which simply says ‘it would be better if it didn’t do so’ in response to the killing of civilians, disgusts me,” Erdogan said. 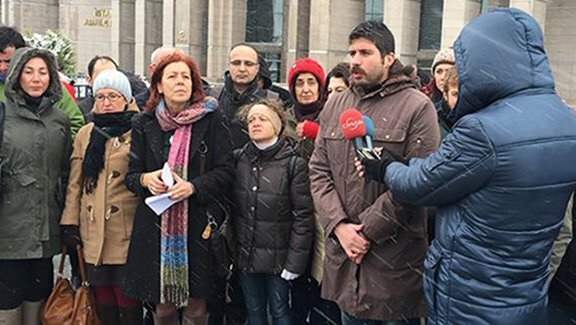 Prosecutors have launched a major investigation into more than 1,200 academics who signed a petition denouncing military operations in the southeast, with at least 18 being detained so far. The EU and the United States have both denounced the probes in unusually strong statements. “They spit out hatred of our nation’s values and history on every occasion. The petition has made this clearer,” he said. “Do you think you can disrupt the unity of this nation? Do you think you can continue to have a comfortable life with a salary from the state, without paying a price?” Erdogan said. “In a state of law like Turkey, so-called academics who target the unity of our nation have no right to commit crimes. They don’t have immunity for this,” he added. All those detained in the investigation into the petition last week have since been released but they still face investigation and eventual trial. In an unusually tough statement days ahead of a visit to Turkey by U.S. Vice President Joe Biden, the U.S. Embassy warned that the investigation risked having a “chilling effect” on political discourse in Turkey. The paper lion Erdogan all he did last 5 years is threaten it’s neighbours, NOW his frustrations is taking from his own people.